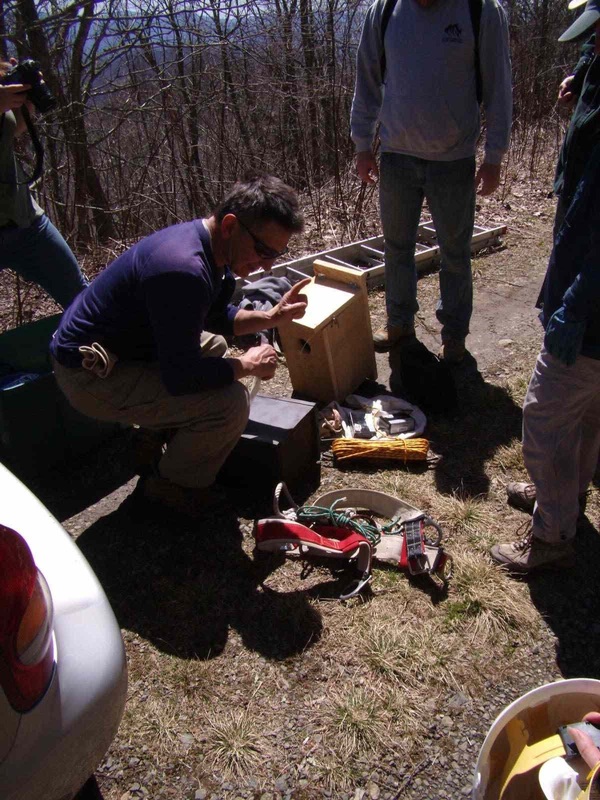 I had the great privilege of volunteering with a crew of folks who were installing saw-whet owl boxes near the Big Bald Bird Banding Station on a beautiful Spring Sunday afternoon. The Northern Saw-whet owl is an elusive little creature. Smaller than the Screech owl, boreal, old-forest inhabitant, mostly, they are hard to hear and hard to study but they are around and it is exciting to hear one. The name comes the warping sound you can make by bending a cross-cut saw blade. A "weep" or "warp" onomatopoetic form. I've heard saw-whets twice. 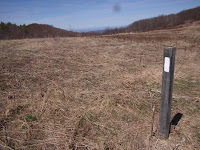 Once was at the Highland Shelter on the AT north of Grassy Ridge. I was there by myself, packing in for one night, heard a single note of a saw-whet and then tried to stay awake so as not to miss another. I failed. The second time was with the auto tour we took up in the Unaka Mountains last summer. We heard one again, once. And that was it. With the forest constantly under attack, both naturally and man-made, their habitat has diminished greatly in the last few decades. But, high up on the balds they may have a better-than-good chance to survive and flourish. As you can see in the first picture it takes a lot of people and a lot tools to get the job done. The boxes were made by volunteers out of 2-inch rough cut saw mill timber. They were heavy and we hope durable. Weather is the king on the bald. The day before this project the valleys were hammered with gale winds and I can not imagine what it was like up on the top in the open. The wind must have been furious. There were 8 of us. We totted around 2 ladders, 2 portable drills, boxes of screws, climbing harness, hard hats, GPS, hand tools, saws, bits, extra batteries, etc. We were like a small army. But we installed 10 boxes. (And no one got hurt.) I salute the installers from yesteryear. They didn't have nice light-weight aluminum ladders. Nor did they have battery powered drills. There are some things that can make this work a little easier. In the second picture, you can see we needed to be in a sturdy tree, about 10 feet up, with a clear flight path, and the house slightly forward (to let the rain run off the roof). A large tree is not always enough and not all that plentiful. On the balds, trees have a hard time growing to size and then they just get hit by lightning. Obviously, young trees and too narrow of a tree won't hold the box. 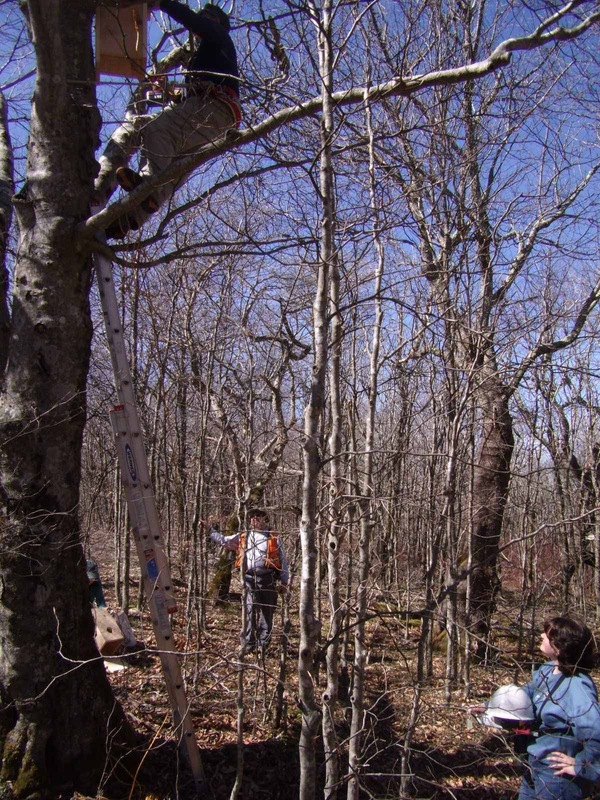 We took some time to select a tree, note its GPS coordinates, number the box, and then get the thing wrestled up the ladder and fastened. sundown can be two different things. 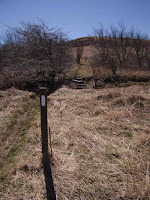 At Carver's Gap, for instance, the trail signs are marked N and S because in a fog you'll get turned around and hikers have been known to get off the trail and then get seriously lost. 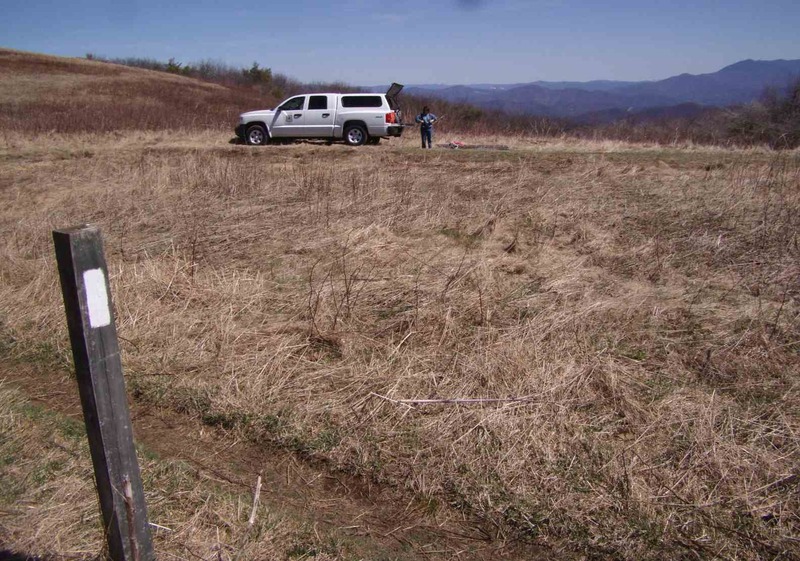 The first photograph (with the truck) looks south into North Carolina. Up the hill in the second photo is Big Bald which is southbound on the trail but feels like west, from where you're standing. 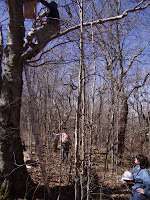 The third photo is northbound on the AT to the Big Bald Bird Banding Station just beyond the ridge. 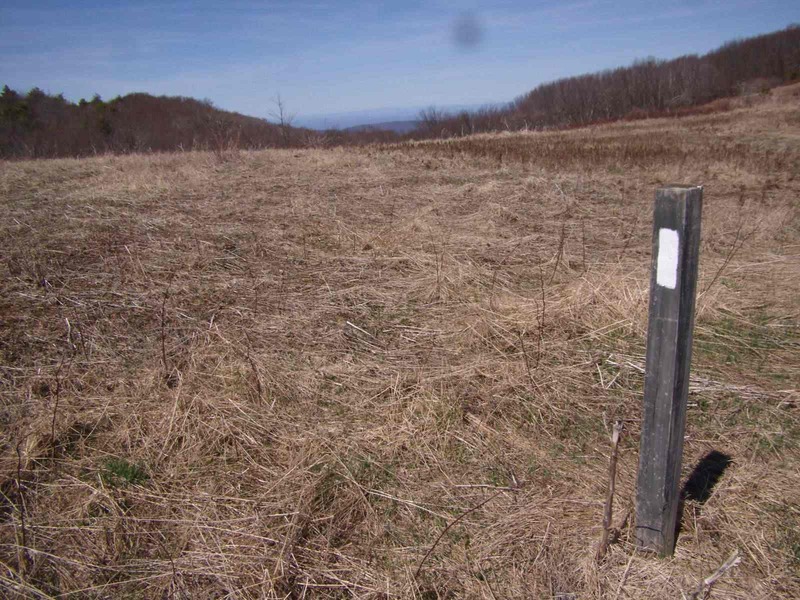 The last photo is looking north into Tennessee. This intersection is an interesting place to stand since it represents state lines and forest boundaries. If you see a Raven while waiting at the truck it counts for North Carolina, not Tennessee. 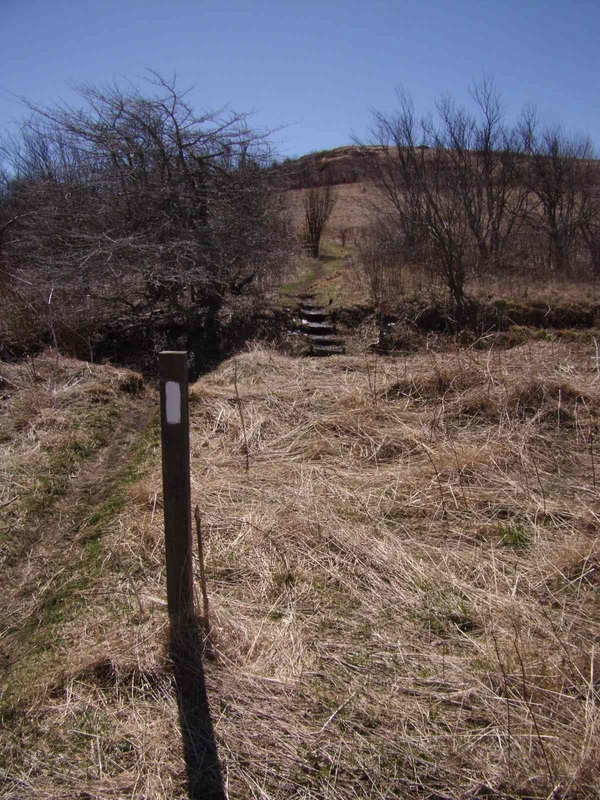 Because the access road is cut into the hillside most of our sites were either straight up one side or straight down the other. We found it easier to let the ladders slide than try to carry them. But, we had fun, too. The weather was very warm. Calm air. Blue sky. It doesn't get any better than this.